Until only a few years ago, I would never have imagined that a volume on the stable isotope geochemistry of elements like Mg, Fe or Cu would be written. In fact, a comic book of blank pages entitled The Stable Isotope Geochemistry of Fluorine would have been a more likely prospect. In volume 16 of this series, published in 1986, I wrote: Isotopic variations have been looked for but not found for heavy elements like Cu, Sn, and Fe .... Natural variations in isotopic ratios of terrestrial materials have been reported for other light elements like Mg and K, but such variations usually turn out to be laboratory artifacts. I am about ready to eat those words. We have known for many years that large isotopic fractionations of heavy elements like Pb develop in the source regions of TIMS machines. Nonetheless, most of us held fast to the conventional wisdom that no significant mass-dependent isotopic fractionations were likely to occur in natural or laboratory systems for elements that are either heavy or engaged in bonds with a dominant ionic character. With the relatively recent appearance of new instrumentation like MC-ICP-MS and heroic methods development in TIMS analyses, it became possible to make very precise measurements of the isotopic ratios of some of these non-traditional elements, particularly if they comprise three or more isotopes. It was eminently reasonable to reexamine these systems in this new light. Perhaps atomic weights could be refined, or maybe there were some unexpected isotopic variations to discover. There were around the turn of the present century, reports began appearing of biological fractionations of about 2-3 per mil for heavy elements like Fe and Cr and attempts were made to determine the magnitude of equilibrium isotope effects in these systems, both by experiment and semi-empirical calculations. Interest emerged in applying these effects to the study of environmental problems. Even the most recalcitrant skeptic now accepts the fact that measurable and meaningful variations in the isotopic ratios of heavy elements occur as a result of chemical, biological and physical processes. Most of the work discussed in this volume was published after the year 2000 and thus the chapters are more like progress reports rather than reviews. Skepticism now focuses on whether isotopic variations as small as 0.1 per mil are indeed as meaningful as some think, and the fact that measured isotopic fractionations of these non-traditional elements are frequently much smaller than predicted from theoretical considerations. In fact the large fractionations suggested by the calculations provide much of the stimulus for working in this discipline. Clearly some carefully designed experiments could shed light on some of the ambiguity. My optimism for the future of this burgeoning new field remains high because it is in very good hands indeed. Approximately three-quarters of the elements in the Periodic Table have two or more isotopes. RiM 16 and RiMG 43 were devoted to H, C, 0, and S isotope variations, and B isotope variations were discussed in RiM 33. The importance of these elements to geochemistry may be illustrated by a GeoRef search of 0 isotope publications, which yields over 25,000 papers, theses, and abstracts spanning over five decades. Isotopic variations of the remaining 56 elements that have two or more isotopes, however, remains relatively little explored, but is gaining rapid attention, in part driven by advances in analytical instrumentation in the last 5-10 years. 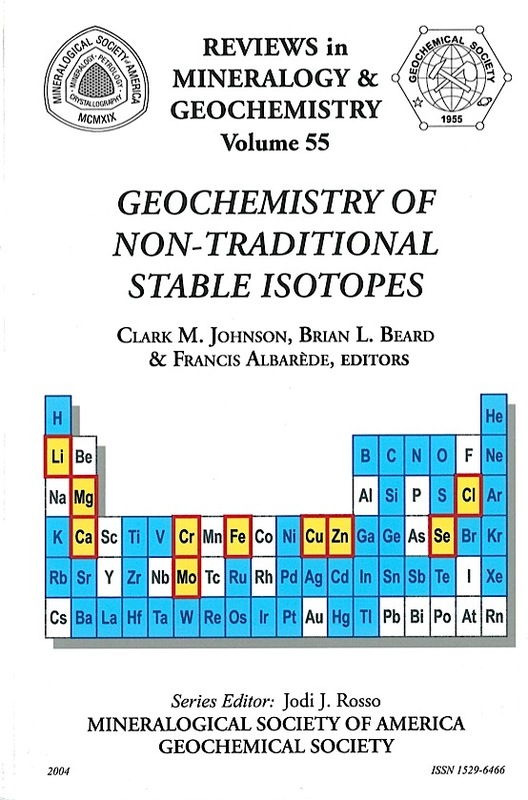 Our goal for this volume was to bring together a summary of the isotope geochemistry of non-traditional stable isotope systems as is known through 2003 for those elements that have been studied in some detail, and which have a variety of geochemical properties. In addition, recognizing that many of these elements are of interest to workers who are outside the traditional stable isotope fields, we felt it was important to include discussions on the broad isotopic variations that occur in the solar system, theoretical approaches to calculating isotopic fractionations, and the variety of analytical methods that are in use. We hope, therefore, that this volume proves to be useful to not only the isotope specialist, but to others who are interested in the contributions that these non-traditional stable isotopes may make toward understanding geochemical and biological cycles. 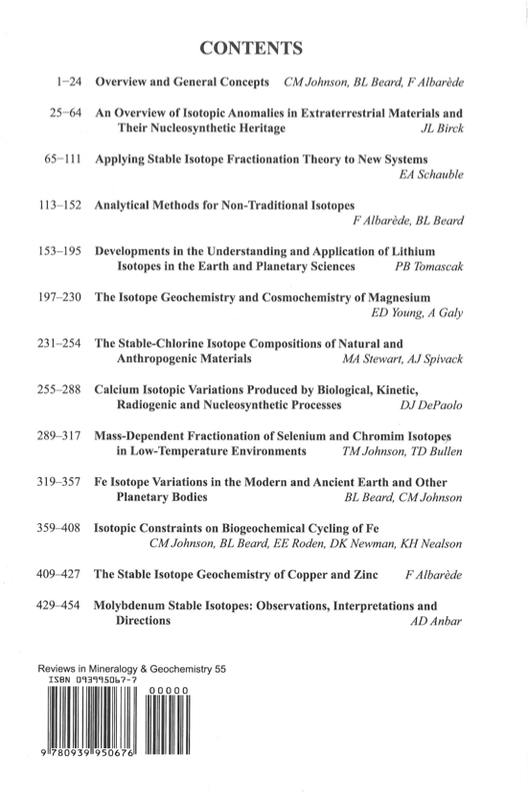 The review chapters in this volume were the basis for a two-day short course on nontraditional stable isotopes held prior (May 15-16, 2004) to the spring AGU/CGU Meeting in Montreal, Canada.